September 8-10, 2000, 8 p.m.
November 8 + 11-13, 2000, 8 p.m. It has the status of a myth: the Golden Gate Bridge, built according to plans by the German engineer Joseph Strauss, officially opened after four years of construction on May 28, 1937; 2.7 kilometers (1.7 miles) long and 27.5 meters (90 feet) wide. Each day, 100,000 cars on six lanes pass through this needle's eye on their way into San Francisco. The bridge has been an inspiration and a backdrop for countless films, stories and legends. 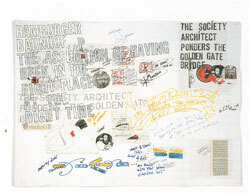 And now it inspires the opera project »The Society Architect Ponders the Golden Gate Bridge – or: How they get what they don't deserve« (2000) by Lawrence Weiner and Peter Gordon. The piece is based on an actual judicial transcript that relates how a high society architect who was driving drunk injured an artist on the Golden Gate Bridge. But instead of receiving justice, the artist himself becomes the object of interrogation by a reactionary judge. Out of an apparently harmless traffic offense, a political discussion is generated as, suddenly, the worth of an artist to society and the role of social privilege in a state governed by the rule of law become the subject of controversy. Lawrence Weiner, born in New York in 1942, developed his works in the late '60s in the context of so-called »conceptual art«. 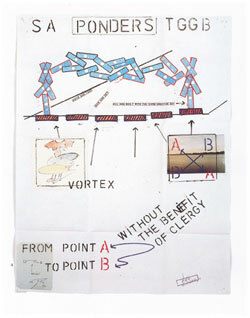 Since then, works defined by the use of language have been central to his artistic production. Language – and the materials to which it refers – is his artistic material, so all channels of communication that function linguistically are available to work with. In addition to films and video works, posters and books, ideograms and pictograms, Weiner began in the early '70s to make use of the unique qualities of the recording media to transfer certain works into musical-auditory structures. A series of records and tapes created in collaboration with various musicians has since become a vehicle for his language pieces. Since 1978, Weiner has also worked with Peter Gordon, born in New York in 1951, one of the pioneers of New York's minimal/jazz/experimental scene. Gordon's style – rhythmic, angular and straight-ahead with an underlying lyricism – has been realized in instrumental music, operas, soundtracks and other forms. After earlier collaborations on film projects and records, such as »Deutsche Angst« (1982), this is the first major music-theater production by the two artists. Events in the series »Works of Music by Visual Artists« are a co-production of Freunde Guter Musik Berlin e.V. and, Nationalgalerie im Hamburger Bahnhof, Museum für Gegenwart – Berlin. The performances in Berlin were made possible by support from Hauptstadtkulturfonds and Verein der Freunde der Nationalgalerie.